I was recently taking photos of the bookshelves in my living room when it occurred to me how out of place one of them was. The shelf was so dark and quite frankly, overly crowded, in comparison to my other lighter colored shelves. I started looking for a replacement (I found the perfect one!) but you know how much I love looking at apartment stuff. Before long, I was down this rabbit hole of looking at all the furniture things and thinking to myself if money wasn’t an issue, I’d totally buy it all. But let’s be realistic. I’ve got travel plans to pay for and right now, redoing my apartment isn’t in the cards. Plus the truth is, I still love how my apartment looks and half my living and dining room furniture are only a couple years old. I just enjoy interior design and the longer I live at my place, the more I’m figuring out my personal style. As to be expected, there are a couple pieces I bought 5 years ago that I’d happily replace now (like that bookshelf I was talking about) but there are other things I still love as much as I did on day 1 (like my purple area rug). I figured since I was finding furniture I really liked, I might as well save them for the future and then I thought, I should share them on the blog! 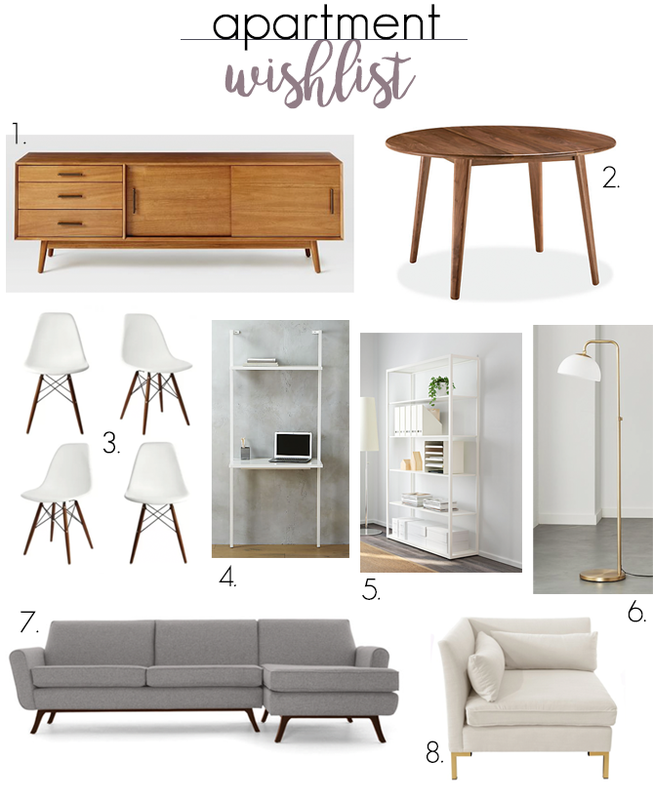 So here’s my apartment wishlist. Maybe you can convince me as to what I should consider buying next! 1. Mid-Century Media Console • My current media console is fine but again, it’s that brown-black color I’ve been slowly moving away from and overly simple. I love how this one is still simple but gives me storage space for my DVDs and would hide my different players. 2. Lowell Round Table • I love the color and shape of this one. It would fit my space given that it’s a bit smaller and it’s not like I have company over all the time. I also think a round table would lend itself better to the centerpieces I usually have (flowers and candles). 3. Harrison Matte Solid Wood Dining Chair • Ok, I know these chairs are everywhere and very on trend right now but how I love them! They’re simple and classic. Right now, I have two dark teal chairs and two stools with yellow/white fabric that don’t quite work for me anymore. 4. Stairway White Desk • Even though I still like the simplicity of my current clear acrylic desk, I like how this stairway desk takes up less space but at the same time offers more room because of the extra shelf at the top. 5. FJÄLKINGE Shelf unit • The shelf that prompted this whole post! So I currently have two of the classic (and cheap) IKEA Billy bookcases in black-brown. I saw this white shelf unit on Instagram and it was exactly what I was looking for. I’m planning to buy one next month but if I could do over my living room layout, I’d buy multiple FJÄLKINGE shelves and fill the whole wall behind my couch with them instead of having different style bookcases scattered throughout my space. 6. Duomo Brushed Gold Floor Lamp • Such a classic looking lamp! (Noticing a trend yet?) I love how industrial floor lamps look right next to a couch. 8. Designlovefest Corner Chair • My accent chair is a gray chevron print which I still like but don’t love. It’s also a bit stiff so I never sit on it unless I have guests over. I prefer the solid, neutral color of this chair and it looks much more comfortable. And what do you think I should buy next?